Google's free learning management system, Google Classroom, is now in full release and is being made available today to all Apps for Education customers. The service had been in limited preview since May. During that time, according to Google Apps for Education Product Manager Zach Yeskel, more than 100,000 educators applied to be a part of the preview, and "tens of thousands" of those educations — from K-12 schools, colleges and universities — actually participated. Classroom is an LMS that's integrated with Google's Apps for Education productivity suite. It allows teachers to create assignments directly within Google's apps, which students can then complete in Google Docs and turn them in through a one-click process. 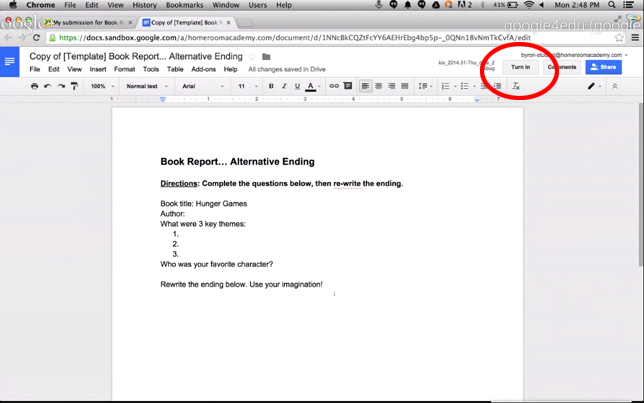 The familiar Google Docs interface adds a "Turn In" button for students at the top right. Once turned in, assignments are no longer editable by students; however, students can cancel the submission to make any necessary changes, and teachers can also return assignments to students when additional work is required. In addition, Google has added two previously unannounced features that were created based on feedback from educators during the preview period. "One thing that we heard during the preview was that educators don't want to wait until students turn in the assignments to start collaborating with their students," Google's Yeskel told THE Journal. "So now with Classroom teachers will be able to view and comment on student work to help them along the way." Using this feature, teachers can actually open students' incomplete assignments and check on their progress and make any suggestions they think are necessary. "And we also heard that educators wanted a simple place to post information, materials, resources about their class," Yeskel said, "so we added an "about" page for each course where they can put their syllabus or their schedule or their room number or whatever it is the want to post about their class." Teachers can return assignments to students with comments. One thing Google is not commenting on yet is integration with third-part tools. Yeskel said there has been considerable interest from the developer community, but no details are being released at this time. Google Classroom is open now to educators and students who use Google Apps for Education Google has made several resources available for schools through its Help Center, and educators who participated in the preview period have also released resources designed to help their peers. Additional details can be found at classroom.google.com.